The Whistle Stop FILM Festival (Filmmakers Interactive Local Meetups) chugging into a town near you! It was a good run. Boulder Community sister Wyoming Community Media ended a nine year run of the FAST Filmmaking Festival (formerly the Shootout) and the Cheyenne International Film Festival. There was a method to the madness. The Cheyenne International Film Festival converged with the FAST Filmmaking Festival as the Cheyenne International FAST Film Festival in 2015, the final year. There will no longer be stand alone festivals or filmmaking contests, so watch for the Whistle Stop FILM Festival, chugging into a town near you, not only in Wyoming, Colorado and Nebraska, but across the country. Silver Sage Village is one six senior cohousing communities in the country. Documentary filmmaker Alan O’Hashi and Boulder Community Media are producing a documentary about aging in community. The data are, 10,000 people turn 65 every day and are wondering where and how they will age and checking out other senior housing choices other than “Sun City” type retirement communities. In addition to cohousing, we’re also interested in other intentional communities such as housing cooperatives, niche communities (veterans); licensed housing communities (Green House); in place housing (Beacon Hill) and others. Silver Sage Village is one of six senior cohousing communities in the country and over the years has experienced a variety of transitions from original members moving to new neighbors arriving to other transitioning to managed communities to others passing away. We’re asking for your help in providing on camera interviews about your experiences in a cohousing community – not about specific conflcts and successes, but more about whether individual differences are set aside when neighborly assistance is required of others. If you’re interested in getting your ideas, experiences and perspectives out there for others to better plan for their futures, be a part of the project by replying to this note or send a direct email to Alan O’Hashi (director of photography) or Mary Ann Williamson (who will be scheduling and conducting interviews). First round of interviews – We’ve heard back from some of you and want to get the ball rolling by setting up some interviews on June 24 and 26. If others decide to participate, let us know. Since the Silver Sage TV room will be under renovation, we’ll have to find another place, which could be meeting you in you home for each interview. As mentioned, the movie is exploring how people can grow old in their own homes and whether living in a community helps or hinders that. Your experiences may help others be better informed as they explore alternative housing options for themselves and their families. 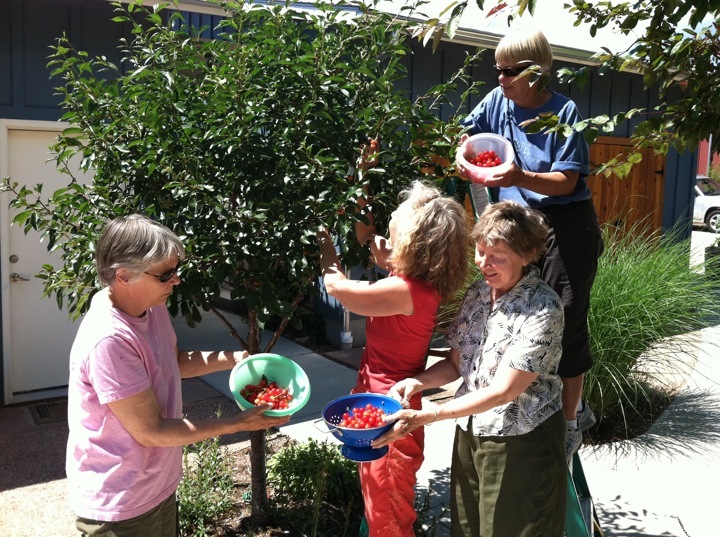 Thinking back, since cohousing and senior cohousing were somewhat theoretical when Silver Sage village formed, what were your reasons for wanting to live in cohousing? After living in a cohousing community for several years now, how does reality match up with your initial reasons for wanting to live in community? Can you recount any times when you were laid up at home, being in the hospital, experienced changes in on going health issues and how did living in a community help or hinder with your helping you? If a person is thinking about moving into an existing cohousing community or starting one, what are a couple hints for them that you learned from your experience living in community?